Water heaters from Stiebel Eltron DHC-E series are designed for homeowners looking for an electric water heater that heats water on demand and provide hot water in endless supply for a single or multi point-of-use and in domestic applications. Stiebel Eltron DHC-E models can also be called under-sink water heaters as the small and lightweight design allows installation under the sink, close to the fixture, where it can deliver hot water instantly. This is exactly its main advantage, short delivery time and since it doesn't store hot water, there will be no energy loss through the heater's walls, as the tank-type. This results in greater installation flexibility, energy, and space savings. There are only a few models from DHC-E series that Stiebel Eltron manufacturer offers, which depending on the given power can provide warm or hot water to one or more fixtures. The units are very simple that do not require additions such as the temperature and pressure valve, drain or mixing valves, making them easy to install and maintain. DHC-E models are equipped with the advanced microprocessor for better temperature control even if the flow or incoming water temperature fluctuates - resulting in less cold-water sandwiches. The electronic control uses the microprocessor technology, and combined with the water flow and two temperature sensors power adjustments on the heating elements can be very accurate. And when compared to the Stiebel Eltron DHC series, DHC-E has one small but visible advantage which is a control knob for adjusting the temperature, not like on DHC model, hidden behind the cover and recommended for installer use only. It has a dual temperature scale and it allows an easy temperature setup - between 86 and 140 F or 30 and 60 C.
The heating elements are made of copper, encased in the copper housing and can provide the maximum power of up to 12 kW. Heating elements operate in stages, again controlled by the advanced electronics and sensors, to use only the energy that is needed, saving you money and time. As the DHC models, these are also dry-firing safe, so no element failures if there is no water around the heating element. This is another series of Stiebel products that are very safe for use at home or small business; safety thermal cut-off, microprocessor, and temperature sensor ensure proper and safe work, so the unit gets turned off if the temperature exceeds the maximum allowed. According to the Amazon.com website, there are mainly positive reviews about the Stiebel Eltron DHC-E. It does the job as it is designed for, and in some cases more than that - supplying two showers for example, making the users very pleased with the performance and capacity. One of the users had a problem with the triggered thermal cut off and early unit replacement due to the high water PH. 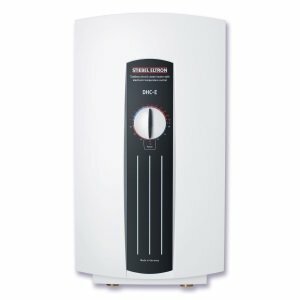 Stiebel Eltron DHC-E water heaters are a great choice for the homeowners looking for a product that can provide hot water instantaneously at one, possibly two fixtures, in endless and continuous supply. And which is more advanced than DHC series but less powerful and expensive than Tempra.